Patchwork and Quilting was not as popular a form of folk art in South Africa during the middle to late 19th century as it was in the United States of America, but there is evidence that, as an art form, it was widely practiced. A study of quilting in South Africa shows that, in spite of isolation these women still thought of patchwork and quilting as an art form and did not necessarily make utility items. Even when they did cover blankets, it is evident that pieces of fabric were not randomly sewn together, but that the maker always strived to produce an article that was also pleasing to the eye. (2) For many house wives, the making of a beautiful, hand made quilt would have been the only activity in her busy day which could take her from her dreary circumstances. When viewing quilts in South African museums, it is evident that very few quilts were in actual fact quilted. Quilts from this era were often lined with a patchwork lining, probably because large pieces of fabric were rather used to make dresses! This way of lining quilts was also popular in the USA and in the Netherlands. There are examples of “wholecloth” quilts, but these articles were mostly used as bedspreads and were as such not thickly padded and heavily quilted. Even though the South African Quilters’ Guild has been searching for our quilting heritage for a number of years, not much is known about the quilters of yester- year. Most museums in South Africa do, however, have examples of old quilts and one of the oldest, kept in the Drosdy museum in Swellendam, dates from 1805- 06. This quilt is made up of five sided and square blocks, artistically arranged to form stars. The quilt was constructed by Sara Christina Dreyer (born 1768), wife of Jan Albertus Munnik (5). It is probable that the brocade fabric used in the quilt came from dresses her mother wore. The rest of the fabric most likely was bits and pieces left over from dresses she had made for her friends towards the end of the 18th century. It is interesting to note that the habit of using fabric from dresses worn by friends and/ or family was also popular in the USA at the same time. Stars were popular designs, as was the Logcabin pattern. A quilt kept in the Cultural Museum in Cape Town was made by Mrs Lategan, Bainskloof in the 1890’s who used the latter pattern. This quilt was machine made. After 1830 the use of chintz for quilt making became popular as it was more reasonably priced. In rural areas in South Africa where fabric was very scarce, it took a lot of artistic innovation to create something beautiful. A woman would often use plain white or off- white fabric as a focal point in a design and then embellish it with hand embroidery. A good example of this technique is kept in the National Museum in Bloemfontein. Quilts were not only made for use on a bed, but also for cot quilts and the Tumbling blocks design was a popular choice here. Cushions, bread coverings and sewing machine covers were also popular items. The Potchefstroom Museum has a sewing machine cover made by Mrs. Kotie Koen from Jacobsdal, made in 1912, in its collection. It is made from brightly coloured squares. It seems that patterns of different blocks were available. These templates were often made from wood, metal or even ivory. The English piecing method of covering paper squares was most often used as handwork was mostly used; a sewing machine was a scarcity in the isolated rural areas. In the museum at the Voortrekker Monument an example of a half finished quilt with some of the papers still in it, forms part of their collection. 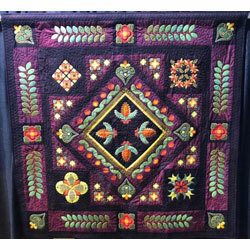 Towards the end of the 19th century, small blocks were sewn into larger blocks which could be finished individually and only then sewn together (quilt- as- you- go) to form a quilt. Today South Africa is part of the global village and South African quilters are internationally recognized by their peers. All the textile art forms are extremely popular in the country and the South African quilt has progressed from the bed to the wall. 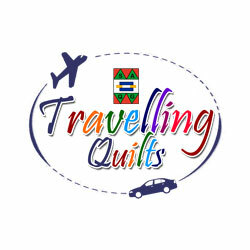 South African quilters, like their peers, travel extensively, they teach, exhibit and produce world class books. 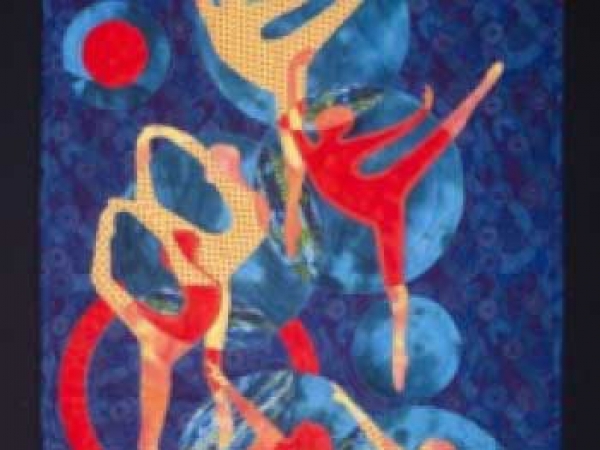 They take part in, and win prizes on, international exhibitions: a few examples of which are the Val d’Argent quilt festival in France, the Tokyo exhibition which is the largest in the world and the Nagoya quilt carnival, all three to which South African quilters are now regularly invited. 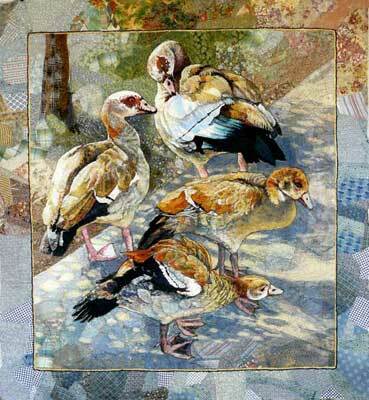 The very ‘plain’ activity of piecing and appliquéing small pieces of fabric has made all South African quilters part of a unique world in which truly South African masterpieces are now created. 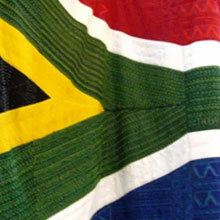 In 1989 the South African Quilters’ Guild was formed.